Celebrating the invasion of Australia requires some truly exhausting partying, and produces an even more exhausting clean-up job. When we’d finally cleaned up every puddle of cooking sherry and got the pig entrails out of the jacaranda trees, it was close to eleven and even my hangover headache had fled in the wake of the horrors I witnessed that morning. Replacing it came a dull dryness in the mouth, eyeballs like saltpans and a surging hunger that gushed over me like goon poured from atop a ‘straya day hill’s hoist. Fortunately life outside house Philistine was largely fine, and life in Teneriffe was very fine, as it always seems to make such a point of being. Depending on where you stand, the heritage-lined streets in that area are either achingly picturesque or the truest embodiment of exclusive inner-city snottiness. I love it, though I’ve met people who find it really repressive. 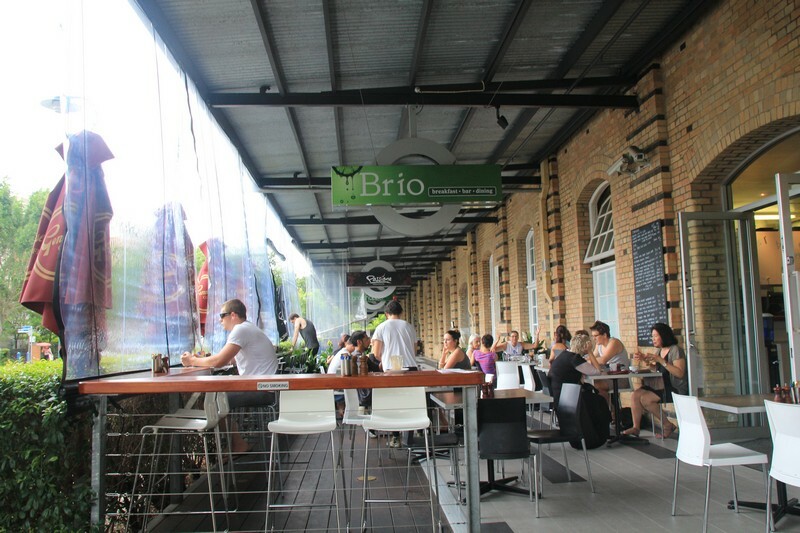 Right at the heart of this rather divisive stretch of town is Brio Espresso and Juice, just at the base of one of the big apartment blocks on Vernon Street. It’s a spacious spot and even with quite a number of diners grabbing late breakfasts it was easy to find seats, and we were quickly brought excellent coffees made with their Genovese espresso, which is very strong and tasty. Food prices turned out to be pretty modest, with most of the breakfast standards present. Juice is less affordable, but really worth a look. They’re very serious about the juice aspect of things, with all kinds of interesting combinations on offer for a slightly hefty $7 a pop. I went with the ‘Summer Fruit Slush’, a combination of lime, orange and berries. Highly recommended. 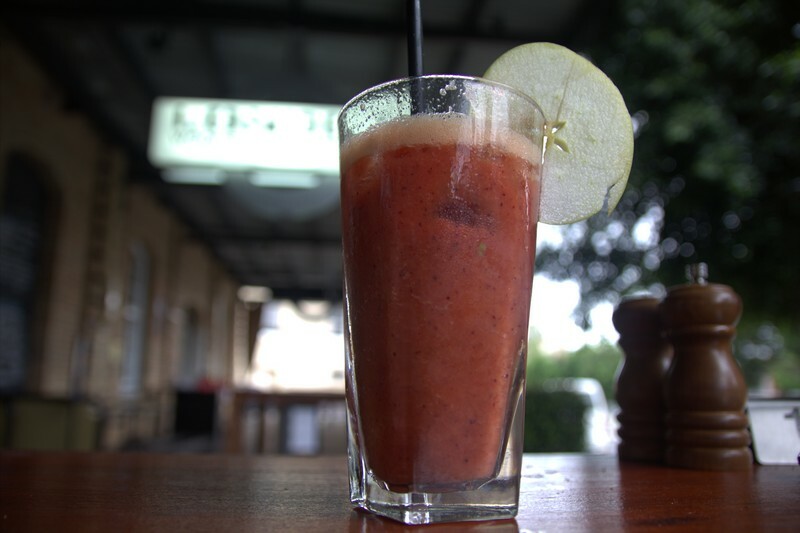 Interestingly, you can get a shot of booze in your juice for an extra $5.50 – a nice option to help lunch transform into early-afternoon boozing, albeit on the expensive side at over $12 for a single 40ml shot of alcohol per drink. Cooking sherry it ain’t. 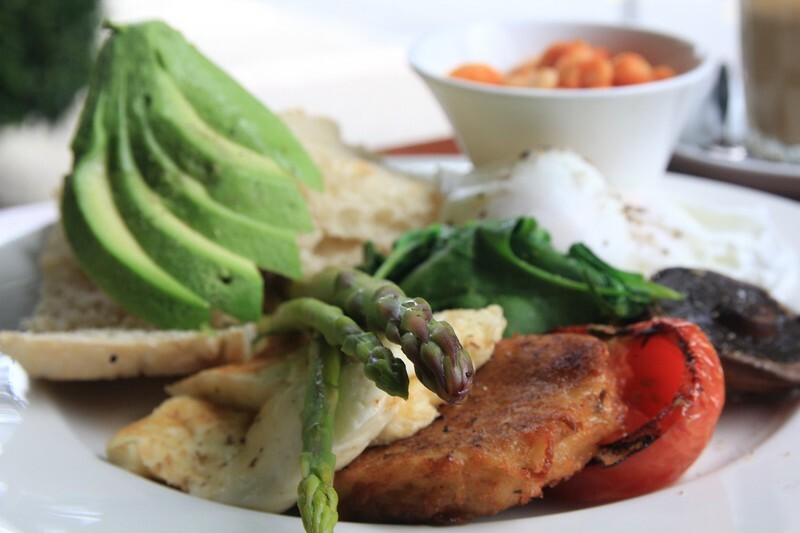 The Mistress opted for the generously-sized ‘vege-out’ breakfast, drawn by a list of roughly every good thing that a vegetarian could hope for in a breakfast: avo, beans, rosti, poached eggs, asparagus, haloumi, mushrooms and grilled tomato. My stomach had at this point become a hangover-abyss, and screamed for something more stodgy. 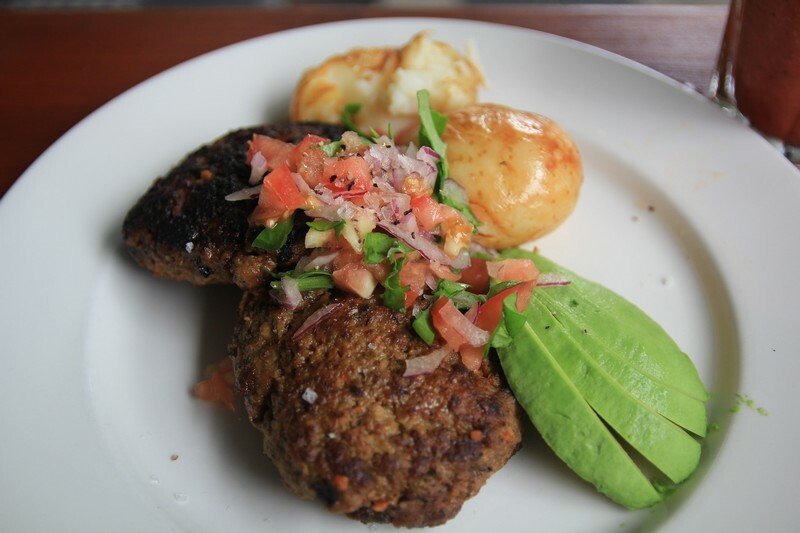 I went for a breakfast that is also served at the German Club as a dinner: rissoles with smashed potato. The rissoles at the German Club are greasy, glistening orbs, each massive enough to have its own gravitational field; Brio’s guys came out looking a bit more like burger patties and mercifully free of sauerkraut or any other cabbage-based food item. Very kindly, the staff offered an alternative to the accompanying eggs, so mine came with avocado instead. Nice touch. Sadly both dishes only did the trick – they didn’t wow us. As with the Deli, they were generously sized and well made, but lacked that finesse that really sets good apart from great. Blandness was a particular frustration for a number of food items, including the mushy rosti, herb-barren rissoles and cool, floury smashed potato. For a dish that offers both avocado and haloumi, the omission of lemon from the veg-out breakfast was particularly egregious, especially in a shop that is consistently full of fruit. To their credit the eggs were perfectly poached and the asparagus deliciously crunchy, but these were the highpoints of an otherwise rather tame meal. Is this the spot for a breakfast adventure? I’m not sure. It’s a safe bet given its large portions and solid quality, but certainly doesn’t offer anything approaching culinary excitement. However, breakfast was never Brio’s selling point – the full name is ‘Brio Espresso and Juice’ and they do a kick-arse job at both of these things. If I were to return for anything more than coffee, it’d be to try the lunchtime burgers, possibly with a vodka-laced juice or three. Maybe you should too. This entry was posted on January 28, 2012 by Philistine. It was filed under Uncategorized and was tagged with Breakfast, Caffiene, Coffee shops, Food, Hangover food, Mixers, Political offensiveness, Pre-drinks, Shrug, Teneriffe. I hope the pig entrails thing was a joke. I think I know it was, and it was hilarious, but there’s a side of me that has a horrible feeling it actually might not have been.